What is a Under radiator sander. It is a sander with an extended nose. 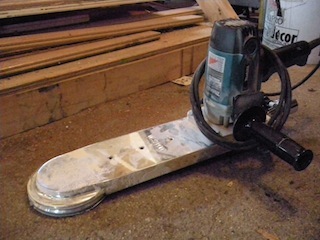 The sanding disc is located about 10 or 12 inches from the motor. Its main use is to sand under areas where the edger cannot reach, like under radiators, baseboard heaters and cabinet toe-kicks are the most common areas. 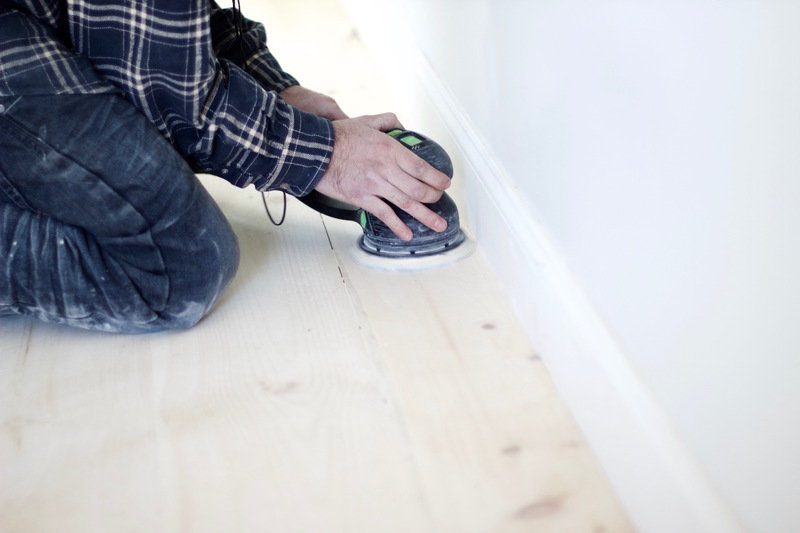 With a special attachment, you can use it to sand narrow areas or along the baseboards, where the edger may leave a 1/2 inch of finish along the perimeters. Using a Under radiator sander - Refinishing any areas, that's unreachable by the edger, such as under radiators, baseboard heaters, under cabinet toe-kicks, low hanging shelves, or narrow areas. Use the same sanding motion as the edger, when operating the under radiator sander. Avoid refinishing the same area to many times, to prevent uneven surfaces. Avoid dwelling or moving the equipment too slow, when refinishing wood floors. Can cause gouges very easily, or dark heat marks. Some of these machine have a speed dial. Where you're able to lower the speed to reduce sanding marks. This is a helpful feature, when doing a wood stain job. Hand scraper: Hand scrape any areas, that wasn't sanded or refinished. Hand scrapers are available in a variety of widths. The widths starts at 1". Although, using a nice wide scraper for refinishing hardwood floors will help get most of the old wood floor finish off. I find it much more comfortable and faster with a narrow 1" scraper. Maintaining a straight sharp edge on the blade is important. It makes refinishing your hardwood floors easy and very little additional sanding is needed, to smooth out the hand scraped surface. Choose one that feels most comfortable in your hands. On, new wood flooring, scrape corners and pencil markings. Scrape with the grain, of the wood flooring, to avoid chipping. Scrape corners so that the boards are even and level with each other. Tip: If, the blade is dull, sharpen it with a hand file. Carbide tipped scrapers are also available. Look for a diamond file to keep the carbides sharp. Try and keep the blade as even or straight as possible, it will make scraping easier and faster. You'll be able to remove more old wood floor finish faster. Orbital sander: sand all areas, that you have hand scraped and edged, with a 100 grit, remove any sanding and scraping marks that the edger, under radiator sander and scrapers, left behind or missed. Tip: When purchasing a palm sander for refinishing hardwood floors. Purchase one with the most horsepower in it's class, the most orbital motion, along with an adjustable speed dial. See Festool hand sanders. You will need the horsepower to remove difficult sanding marks. An adjustable speed dial will help you deal with different types of wood specie. The more orbital motion the smoother and mark free the wood surface. You will want to be less aggressive with softer wood floors, because these wood species mark up, much easier. You can hand sand these areas, also. If, you don't have an orbital sander. You will have to hand sand, with the wood grains, under radiators and cabinets. Palm sanders cannot reach these areas. Now, you're ready to Screen or Buff your newly refinished hardwood floors.